Not many war films have come close to Saving Private Ryan (1998) in recent years, but this one certainly gives it a run for its money! The setting: April, 1945 – With Hitler desperately deploying all men and now women and children to fight, the allies make their final push in the heart of Nazi Germany. 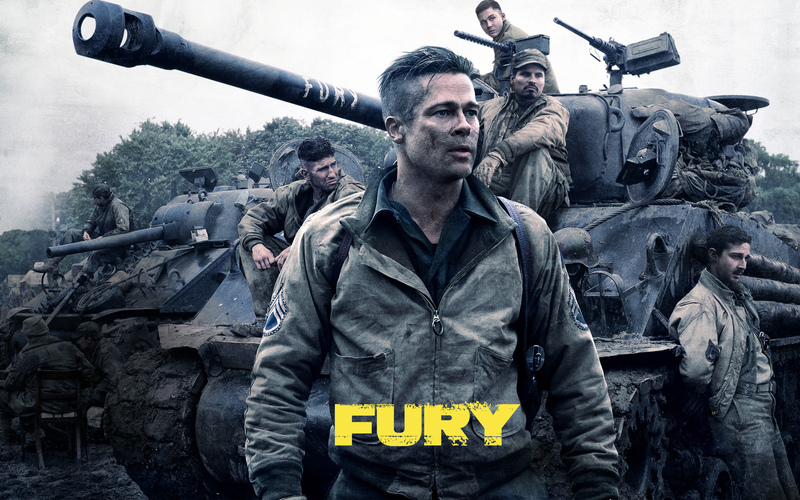 This film focuses on the crew of a Sherman tank named “FURY” and their deadly mission to wipe out the Nazi forces. Even though Brad Pitt’s lead role in this film takes centre stage, the quality of this film depends on an incredible group effort! One could say that the story even focuses on Logan Lerman’s young and inexperienced character ‘Norman’, who has been transferred from a typist’s desk to fighting for his country from a boiling, sweaty, death-filled tank. The journey David Ayer takes us through in this film is emotional, distressing at many points, yet uplifting in the sense of what these men did for all of our countries’ freedom today. Not many directors have managed to steer away from the glorified American soldier like Ayer has in this film. He manages to make us disgusted with them, hate them, feel sorry for them and ultimately root for them all in the space of 2 hours! Two things that stood out for me even before I had seen this film, was the commitment to method acting from the director and actors involved. Ayer has recently said in an interview how he made the five men prepare for the film, by living in the tank for days (as the troops would have done) giving them a real feel for the life of a soldier. This method must have registered with Shia LaBeouf, who was rumoured to have cut his face, on-set, because he felt his make-up was not realistic enough. It is these back stories, as well as superb acting from all involved and a strong, genuine and gritty plot which make for an incredible and moving motion picture, which truly needs to be seen on the big screen! Recommendation: MUST SEE and definitely a film that deserves to be owned in Blu-Ray!